In case the 92,000 people sitting in LSU’s Tiger Stadium somehow forget, for a moment, that they’re in Louisiana, a quick look up at the advertising signs along the luxury skyboxes will remind them. 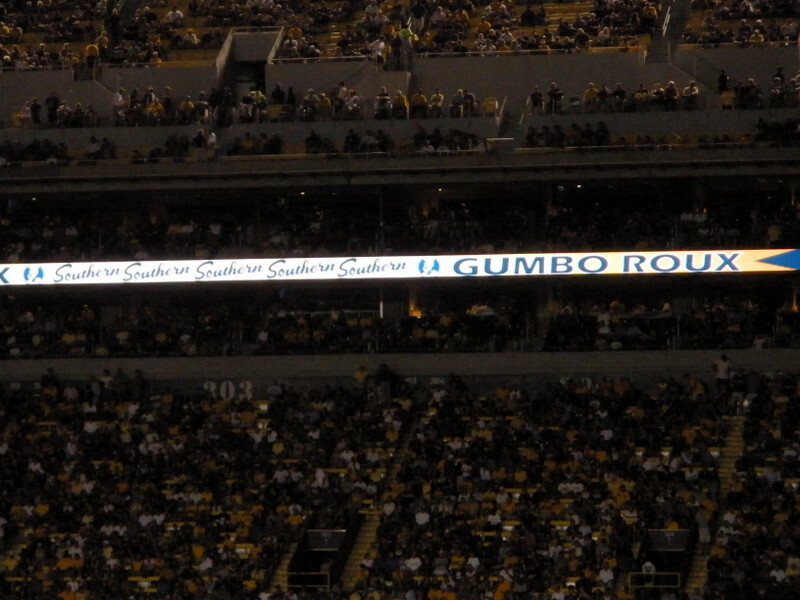 Yes, that’s a digital sign advertising “Gumbo Roux”….specifically, Southern brand pre-made roux in a jar, made in Jennings, LA. I’m guessing they’re marketing to a pretty broad geographic area if they feel compelled to call the product “gumbo” roux. I’ve never used Southern brand, so I can’t vouch for it, but I see it on the shelves at my local Wal-Mart, so someone’s buying it.